This question comes up a lot. Instead of it being posted over and over, I figured I would answer it here. 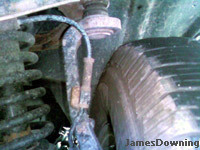 The Trailblazer suspension has an overhanging upper ball joint. While it provides an excellent turning radius for the vehicle, it inhibits the user from going too large with the tires without making other modifications. From what we at ORTB have measured and other people have reported, the maximum tire diameter without modification is 30.5". If you go over 30.5" diameter, we suggest wheel spacers and a lift. See the other sticky in this section for more information on wheel spacers. James,Thank you for this post. I have a few questions real quick if you don't mind.....I called Fred about the wheel adapters..I will call him back tomarrow it's getting late for me...anyway #1. If the tire I'm gonna get now is 30.6" couldn't I just use the wheel adapters for now so there would be no rub and essentially give me the space I need for that tire or no it doesn't work like that? #2 How much were your wheel adapters? I'm just trying to get A hold on how much everything will be minus the body lift.. Thank you! 30.6" is one of those questionable sizes. More than likely it will fit without modification, but I cannot guarantee it. It will be very close. Yes, you can run any size tires with wheel spacers. You don't HAVE to be over 30.5", but it doesn't make much sense to get it otherwise. so then I could get the wheel adapters and the Dur aTracs from GY and I wont have to do a suspension lift right now? so if i get MarcMc's 2.5" lift what would be the maximum tire size i could put on? i have 17" rims...but if i get the max tire size would i have to do any cutting in the wheel well? MarkMC 3" suspension lift. MarkMC 1.5" Spacers. Bilstein HD front. Skyjacker rear. 265/70/17 Gaurd Dogs. Please see the first post regarding maximum tire size. The purpose of this thread is, in fact, to explain this. As far as cutting, it is handled on a case by case basis, as your particular tire choice in relation to your vehicle may affect it. Above all, please remember to read thoroughly before asking questions. Chances are that most have been answered already. The big question is... are you getting wheel spacers? If you are not getting wheel spacers, then your limits are as outlined above. From then on out, your tire size limits are dictated by how much trimming you want to do, how wide your tires are, what your overall offset is... etc. No simple answer really. I recommend looking through the build threads to see what others have done. With a R/C 2" level kit, I run a 265/65/18 BFG A/T T/A KO (31.56" dia.) on American Racing Marin 18" x 9", 6 x 5" wheels. This wheel is one of the few that fit TBs without spacers. Did cut 10" out of front fender wells. Didn't need to that cutting, needed to reset my bumper. Hi, Trailx thanks for the information on tire and wheel sizes for Trailblazer. Mine is 2014. Right now I am running Nitto All Season 285/45/22 and no rubbing. I want to change to a BFG A/T KO2. What is the largest tire rim combo I can install without any mods and what would be the correct offset? I would like to go no larger than 18" and Rim of choice is Fuel Vapor matt black. I am in Thailand and it really tough getting answers. So, if you can advise I sure would appreciate it. Thanks. We don't really know anything about the new Trailblazer since we don't have it available to us over here.